Edmonia Lewis, the first professional African-American sculptor, was born in Ohio or New York in 1843 or 1845. Her father was a free African-American and her mother a Chippewa Indian. Orphaned before she was five, Lewis lived with her mother’s nomadic tribe until she was twelve years old. Lewis’s older brother, Sunrise, left the Chippewas and moved to California where he became a gold miner. He financed his sister’s early schooling in Albany, and also helped her to attend Oberlin College in Ohio in 1859. 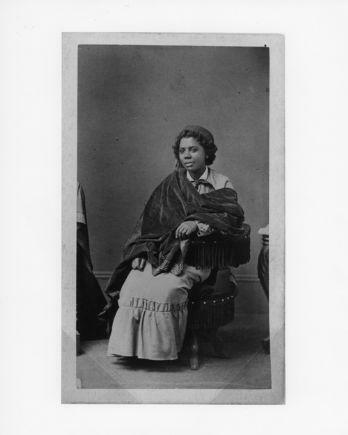 While at Oberlin she shed her Chippewa name “Wildfire” and took the name Mary Edmonia Lewis. Her career at Oberlin ended abruptly when she was accused of poisoning two of her white roommates. Lewis was acquitted of the charge, though she had to endure not only a highly publicized trial but also a severe beating by white vigilantes. Subsequently accused of stealing art supplies, she was not permitted to graduate from Oberlin. Lewis left Oberlin in 1863 and, again through her brother’s encouragement and financial assistance, moved to Boston. There she met the portrait sculptor Edward Brackett under whose direction she began her limited sculptural studies. She was determined to become a sculptor. With a minimum of training, exposure, and experience, Lewis began producing medallion portraits of well-known abolitionists such as William Lloyd Garrison, Charles Sumner, and Wendell Phillips. With sales of her portrait busts of abolitionist John Brown and Colonel Robert Gould Shaw, the Boston hero and white leader of the celebrated all-African-American 54th Regiment of the Civil War, Lewis was able to finance her first trip to Europe in 1865. After traveling to London, Paris, and Florence, Lewis decided to settle in Rome where she rented a studio near the Piazza Barberini during the winter of 1865 and 1866. When Lewis arrived in Rome, sculptors favored the neoclassical style that was marked by a lofty idealism and Greco-Roman resources. She quickly learned Italian and became acquainted with two prominent white Americans living in Rome, the actress Charlotte Cushman and the sculptor Harriet Hosmer. A number of other American sculptors lived in Rome at this time because of the availability of fine white marble and the many Italian stonecarvers who were adept at transferring a sculptor’s plaster models into finished marble products. Lewis was unique among sculptors of her generation in Rome as she rarely employed Italian workmen, and completed most of her work without assistance. Her motivation was probably twofold: lack of money and fear of the loss of originality in her work.